Hundreds of thousands of Brazilians hit the streets of a dozen state capitals this past week. 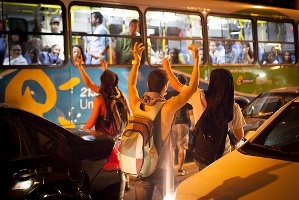 The initial trigger was a proposed hike in São Paulo bus fares, already among the world’s most expensive, but news media soon reported that the protests reflected anger with the rising cost of living, crime, corruption, impunity, and the high costs of hosting the World Cup. Lackluster public services haven’t helped, and widely televised police violence last week provided another rallying cry. Polling by Datafolha shows that the protest is a middle class phenomenon, with 77 percent of the marchers in São Paulo claiming a university degree. This growing demographic group is turning against President Dilma Roussef’s Worker’s Party (PT) but it is also weary of the opposition PSDB, especially in São Paulo state. So far, the protests have been difficult for political parties to harness for their own ends. Partisans who showed up at the marches on Monday waving party flags were reportedly forced to pull them down by indignant protestors. Dilma’s popularity has been falling – she was recently booed at the opening match of the Confederations Cup – but the marchers don’t seem collectively exercised about her policies or those of any single party or politician. Aecio Neves, Marina Silva and Eduardo Paes, her potential opponents in elections scheduled for late 2014, have yet to capitalize on her vulnerabilities, as the protestors seem to be casting “a pox on all their houses.” An outside candidacy is a rising possibility, but Brazilians have been wary of supposed political saviors after the rapid rise and fall of Fernando Collor in 1990‑92. Anger is directed at the political class as a whole because it is incapable of responding to public disgust with Brazil’s unsatisfactory public services. It is quite possible that the protests may peter out on their own, especially if the renewed violence seen in São Paulo on Tuesday night alienates supporters. If the protests continue and remain peaceful, they may result in increased social solidarity and a shared sense of patriotism in the face of an unsatisfactory political system. Something similar happened during other mass protests in the past, especially the Diretas Já marches of 1985. A renewed consensus in favor of a more robust and effective democracy would be salutary, but the concrete results arising from the protestors’ demands are difficult to predict. One thing to be sure of: withdrawing the proposed bus fare increase proposal is too little, too late.